One of the most requested features in XSplit Broadcaster is the ability to pull chat feeds from streaming services such as Twitch and Hitbox so it can be easily shown on the stream without needing to use screen capture. There are various workarounds to achieve this but they are definitely not ideal. 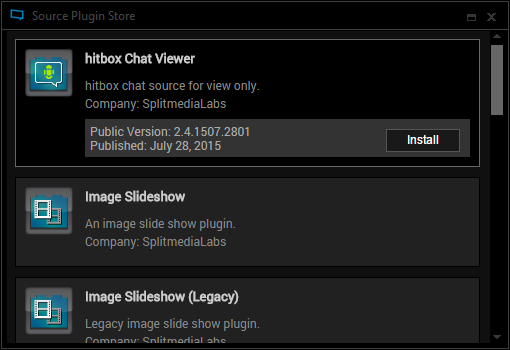 That's why we're excited to announce that the Twitch and Hitbox chat viewer plugins are finally now available in XSplit Broadcaster. To install both plugins, click on 'Add Source' >> ‘Get more plugins from the plugin store'. Find the plugins and hit the Install button. Now that you've installed them, it's time to add the source on your scene. 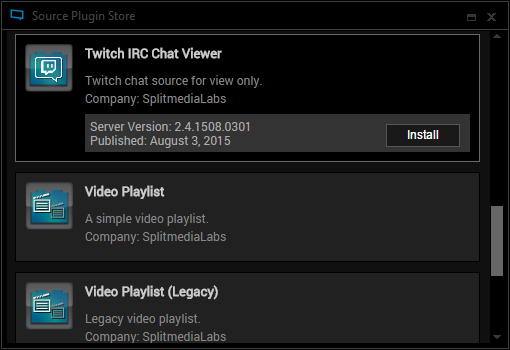 To add, simply click on 'Add Sources' >> 'Other' >> Hitbox Chat Viewer / Twitch IRC Chat Viewer. After adding it, right click the source and authorize it first. When done authorizing your account, hit the 'Connect' button and you're done! Take note that for this version of the Twitch IRC Chat Viewer, we currently do not support connecting to group and event chats. We shall be adding this in an update in the near future.